Luxury motor yacht MERCURY OJ offers luxurious accommodation for up to 8 yacht charter guests in 4 cabins. 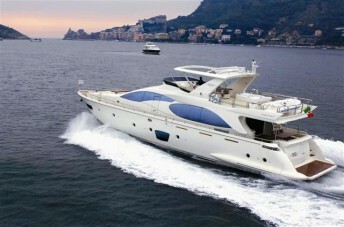 MERCURY OJ is a fantastic 2006 Azimut 85 which luxury motor yacht. This Azimut offers contemporary design, breathtaking beauty, and a range of amenities to delight and entertain even the most critical user. Azimut's latest masterpiece motor yacht the Azimut 85 is a Grand Tourer of the sea; stately, luxurious and panoramic: “a floating home for home”. This is the concept that was elaborated by Stefano Righini and Carlo Galeazzi together with Viareggio’s Azimut team. Amongst this Azimut 85 long list of features, the fly bridge of the luxury motor yacht comes complete with a hydro-spa to relax and refresh yourself while cruising to your destination. A concept that evolved into a just over 85 feet long and nearly 22 feet wide villa on the sea. Ample windows on decks, dilated volume and an “original” layout are only a few of the many assets on this new Azimut 85’ fly bridge. The yacht has an all new Galeazzi minimalist interior, with a huge salon, 1 Superb Master cabin, 1 large VIP cabin and 2 further Twin cabins.